Lynette’s husband has cheated her out of her family business. She will need to get it back by earning money in real estate. During the game, you play Lynette’s Director of Business Development and are in charge of helping her build and turn hotels and motels into money making venues. 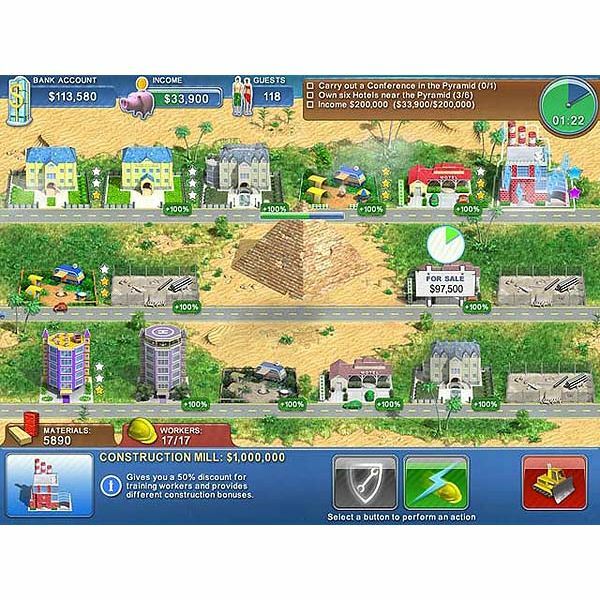 It is a time management game where strategy involves balancing resources, money and property. During each level of play, you will have specific tasks that need to be completed in order to move forward in the game. To construct a building, you will need an available open space of land. Any area that you own will display in color, while property owned by someone else will appear grayed out. To build anything in Hotel Mogul, you will need resources and workers. Resources and workers can be obtained by clicking on the appropriate tab located at the bottom of the screen. 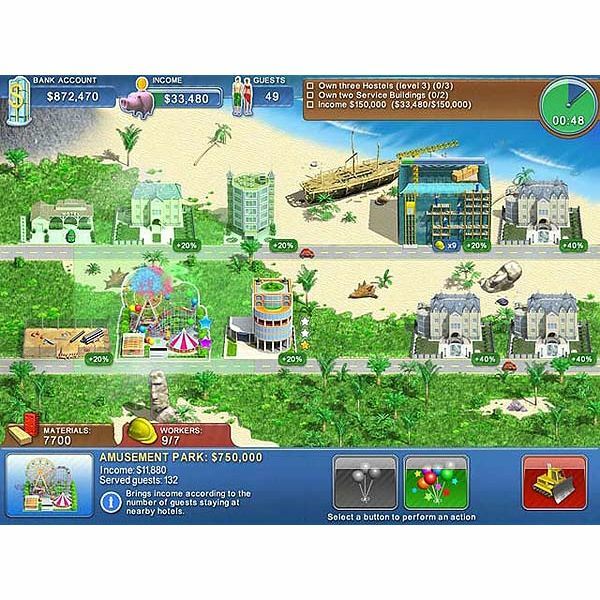 Build a hotel or other structure by clicking directly on the available land. The available types of hotels you can build will display. Click on the building icon you want, and the construction will begin. As hotels and other structures are build, your income increases. Income can be increased further by upgrading your buildings. All hotels and motels can be upgraded to three levels. The current number of upgrades a building has is equal to the number of star icons located next to it. You will also need to maintain buildings when they need repair. A wrench icon appears above the building when it needs work. Game play on a level continues until all goals have been met. In between levels, you can obtain new building plans and other items that will help you generate income. Items that are important to obtain will be highlighted by white sparkling icons. While a building is being repaired, it is not generating any income for you. Selling property is a way to get extra income fast. You can wait for the best price offer (which will take a little bit of time) or you can sell it straight out for less money and get cash faster. Placing statues in between hotels will generate a +40% bonus to the amount of money earned from those structures. If you did not earn a gold trophy on a level, you may need to go back and re-play it in order to meet the goals of other future levels. Try to avoid building a hotel in area that displays a negative percentage next to the property. Instead, put any other type of building there. The “conference" bonus will earn extra money for any of your hotels and motels you have built. When you have this bonus, on occasion a check icon will appear in front of the building. Quickly click on it to obtain the extra money, since this icon will disappear in a short amount of time. The larger the hotel or building, the greater amount of profits it will generate. However, they have a higher initial building cost. Alternatively, smaller properties are cheaper to build and generate a more modest amount of money. If you don’t have enough points to pick up an item in the shop that you need, go back and play any previous level where you did not earn a gold star (expert time). Once you earn a gold star, it should give you enough points to move forward in the game. To succeed in level 18, begin by selling the Business hotel. With the money, purchase $250,000 worth of supplies and buy the empty real estate lots. Build the Guest houses on the twenty percent lots. Place a statue on the side of each Guest house. On the bottom row put a Memorial in the second lot from the right. Build a garden in one of the sections in the top row. When all of these tasks are completed, build more Business hotels until you reach the goal of 110 percent income. *Screenshot images for the Hotel Mogul game were created by Sheila Robinson.